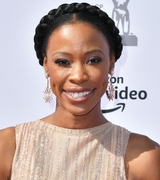 Welcome to Karimah Westbrook Online your source to follow the news of actress Karimah Westbrook, born October 06. Karimah has played in roles opposite Alfre Woodard in American Violet, Johnny Depp in The Rum Diary and Julianne Moore in Suburbicon. Have a great visit on the site!